Uttar Pradesh saw a huge jump in the admission in schools under Right to Education(RTE) act. This acted as a great relief to many lower middle class and poor people. There are many families in UP who is not capable of sending their kids to a good private school. 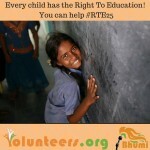 Also, many places are in the state are unaware of the RTE act. According to a report, a total of 15,626 students got admission in 49 districts while the number of applications was 21,789. This number is an exponential growth when compared to the data of last year which was just at 4,400. The number was much lower in the prior years 2012, 2013, and 2014, and in those years the number of intake was 108. The reason for low turnout in previous years was maybe the lack of awareness in many districts. The reason for the lack of awareness was due to late enacted RTE in the state. While the country started RTE act in 2009, UP formed the RTE rules in 2011 and implemented in 2012. This year the data of admissions may show a feat in the number of admissions, it cannot be neglected that 26 districts have been left out and other district showed a lower turnout. Varanasi showed a maximum number of admission where 3,318 were enrolled in the private schools. Agra and Lucknow followed Varanasi with the figure of 3,000 and 2,920 respectively. The foundation behind the admission under RTE was laid by Basic Shiksha Adhikari (BSA). It worked as a media to create awareness among parents and society. It worked well, however, it couldn’t cover the whole part of UP. RTE crusader and founder-chairperson of Bharat Abhyudaya Foundation (BAF) said BSA worked very well in some parts while in other parts it didn’t work well but it has opened many opportunities for many families especially whose first generation got admission in private schools. During the process of creating awareness, BAF noticed that many private schools are unwilling to take admission under RTE act. These schools might get advantage from those seats. BAF said if RTE act would be used efficiently, UP schools can assist 50 lakh deserving students in the next 8 years which can really change the face of education. GHAZIABAD: The district administration of Ghaziabad has issued directions to private schools to ensure admission of students, belonging to disadvantaged groups and weaker sections, under quota of seats reserved for them. The directions were issued in a meeting held by district magistrate Nidhi Kesharwani with principals and managers of two dozen schools in Ghaziabad on Monday. The meeting was summoned after the district education department received complaints against eight schools who denied admissions to students, referred by the department, under various reserved categories. Following the implementation of the Right to Education (RTE) Act, 2009, the basic education department of the Uttar Pradesh government issued orders specifying various disadvantaged groups and weaker sections who can seek free admission in private schools up to a maximum limit of 25 per cent of total seats available. The disadvantaged groups include children belonging to the Scheduled Castes and Scheduled Tribes category, specially-abled, those from the socially and educationally backward sections, whose parents are affected with HIV or cancer, the homeless and orphans. Weaker section category includes children from below poverty line (BPL) families, whose parents are recipients of disability, old age or widow pension as well as those children whose families’ annual income does not exceed Rs 1 lakh. “There was lack of clarity among the schools regarding various categories under which admissions can be provided to students in accordance with the government orders. These issues were clarified. The schools have assured they will ensure admission to students wherever they meet the criteria for the specified categories,” DM Nidhi Kesharwani told TOI. Bijnor: Keeping in view the lack of awareness among the poor about free education in private schools under the Right to Education Act, the State government has now set a target of admitting 50,000 students this year. According to the provisions of the RTE Act, there is 25% reservation for BPL cardholders, who can admit their children in private schools without having to pay any fees. Considering the lack of awareness in this regard, the State government has set a target of admitting 50,000 students this year. Also, Bijnor has been given a target of admitting 990 students. Though there are around 3000 public schools in Bijnor district, there is no child having free education in private schools. According to sources, the situation is similar in the other states. To improve the situation, State director of Sarva Shiksha Abhiyan held a meeting at Lucknow on July25 and assigned targets to all BSAs. Elaborating on the same, Bijnor BSA Sanjay Kushwah told TOI, “There is a target of 50,000 students to be admitted in private schools. Besides, Bijnor district has been given a target of 990 students in nursery and first standard.” “These admissions are meant for nursery and first standard only. We are all set to implement this scheme and will start a campaign to create awareness among the poor so that they can also send their wards to private schools,” he added. Agra: A convent school here allegedly cancelled the admission of a 3-year-old girl in nursery class after she had been admitted under the provisions of the Right to Education (RTE) Act because her father asked the school administration for a receipt against the school diary which he had to buy. Ravi Mahore, father of the girl, Bhomi, has a bicycle repair shop and the family lives at Tota ka Taal locality in Lohamandi in the city. He brought the matter to the notice of local RTI activist Dhanwan Gupta and thereafter they met education department officials to lodge a complaint against Holy Public School, which is also located in Lohamandi. “Bhomi was admitted at the school under RTE Act. However, we asked for a receipt for purchase of the school diary. She went to school for just three days and on the fourth we were told her admission had been cancelled,” said Ravi, talking to TOI. The school opened for the current session on July 4 and the family was informed that Bhomi’s admission had been cancelled the following day. In the previous session, she attended two days of school before it shut for the holidays. “I contacted the school principal but he did not give any valid reason to explain why my daughter was not eligible. She had been selected on the basis of procedures followed by the education department. Even her date of birth, May 28, 2013, means she is eligible for admission to nursery class under the norms,” the father added. The father and Dhanwan Gupta then approached basic shiksha adhikari (BSA) Dharmendra Saxena and other local officials, but no action has been taken against the school so far.”The parents are financially weak and can’t send their daughter to school on their own. Despite laws, there are many hurdles for poor citizens who want to send their children to good schools,” Gupta said. School principal Namrata Agrawal denied the allegations. “Bhomi has not attended school for a single day as her form had been sent to the BSA’s office in April to clarify if she was eligible on the basis of age. We are still awaiting a nod from the BSA. Why would I stop children who had applied through the Act? We have allowed the maximum number of students in the city under RTE,” she said. School chairman and president of Association of Progressive Schools of Agra (APSA) Sanjay Tomar said that the girl was stopped from attending school due to age issue. “The family has been asked to sort this with the BSA, after which the girl can attend school,” he added. Agra division assistant director (basic education) Girijesh Chaudhary told TOI that he was unaware of the matter. “I will look into it and try to sort it with the school management and parents,” Chaudhary said, adding that action will be taken in case of any wrong decision, as it concerned the future of the girl child. BSA Dharmendra Saxena was not available for comments. Agra: New academic session in most of the schools has begun but at least 600 children belonging to the economically weaker section (EWS) are left in lurch due to the alleged apathy of basic education department. The department got about 600 applications under the EWS category for admission to private schools under the Right to Education (RTE) Act this year. According to the act, all the private schools have to reserve a portion of the seats for children belonging to the EWS category. Even though, the classes in all the schools kicked off from April 1, the education department is yet to complete the data feeding work of the application received under the category. It is only after the feeding work is done that the department starts the next step of inspection to short list the candidates who fulfil the criteria. According to officials, the entire process may take around 15 to 20 more days. The department officials had earlier claimed that they will complete the process before the beginning of new session. Basic shiksha adhikari (BSA), Dharmendra Saxena, said that some of the applications came late leading to the delay. “Data feeding work is almost complete. Few forms came late due to which the delay occurred. Department will ensure admission of all eligible students in private schools of their choice free of cost under Right to Education as soon as possible,” Saxena told TOI. In the previous academic session, the department had listed only 92 children eligible for admission to private schools. 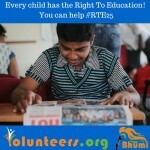 RTE Act came into force in 2009. Under it there is 25% quota for students from weaker section in private schools. In this article I wish to examine the implementation of the 25% reservation clause under the RTE Act in Uttar Pradesh (UP). It has been reported that the states with top 10 fill rates under 25% reservation clause (in %) included Delhi: 92.08, Madhya Pradesh: 88.24, Manipur: 64.77, Chhattisgarh: 63.1 and Sikkim: 50.26 while UP was 3.62 (Indian Institute of Management, Ahmedabad, Central Square Foundation, Accountability Initiative and Vidhi Centre for Legal Policy (2015)). The same report estimates that the 25% reservation clause in UP would cover 6,37,149 seats, out of which 5,65,406 seats are in the rural areas (National University of Educational Planning and Administration 2014). In the last admission season (until June 2015) only 3061 admissions were approved by the Basic Education officers in the state under the 25% reservation clause. This debacle was created by three regressive government orders (GOs) notified by the state government in 2012, 2013 and 2015. There are droves of children who are perpetually spurned by the school authorities citing provisions from these regressive GOs. 1. The neighborhood area for implementing RTE shall be a “ward” and not within 1.0 km radius from the home of a EWS child seeking admission (GO 2013). 2. The 25% reservation clause shall be applicable only in urban wards and not in rural wards (GO 2015) (GO 2015). 3. Those wards have to be identified where no government/board/aided schools exist and 25% reservation clause shall be applicable only in private unaided schools of such identified wards (GO 2015). 4. Students can be arbitrarily rejected on grounds of age. There are a bunch of petitions which have already been filed before the Allahabad High Court and many more are anticipated in the months to come impending next academic session. It is imperative at this stage to demystify these four categories for its sheer impact on the looming fate of several children. It is pertinent to mention that vires of these GOs have already been challenged in a Public Interest Litigation (PIL), Ajay Kumar Patel v State of UP (Writ Petition No 3334 of 2016). This PIL was admitted by a division bench comprising of the Chief Justice Dr D Y Chandrachud and Justice Yashwant Verma on 27 January 2016 and its hearing is going on before the Allahabad High Court. Rule 2 (c) of Government Order No 539/79-6-2013 published on 20 June 2013 says that “wards” (wards are the smaller units of a district where each district is subdivided into many wards based on its population and not on distance) shall be the relevant unit of defining “neighbourhoods” under the RTE Act and the UP RTE Rules, 2011 (the Rules). The “neighbourhood” as defined under Rule 4 (1) (a) read with Section 6 of the RTE Act should be within 1.0 km from the home of an EWS or disadvantaged children. These definitions are clearly contradictory. We are however of the view that the paramount purpose is to provide access to education. Whether for that access, the child is to travel within 1 km or more is secondary. The state government must dispense with its regressive attitude and devise guidelines explicating the contours of “neighbourhood” in the upcoming admission season. Perhaps, “wards” may be kept as units and preference may be given to those EWS students whose residence falls within 1.0 km from such private unaided schools. It is proposed that in case of conflict between “ward” and “1.0 km” rule, “1.0 km” rule must trump the ward, otherwise both may operate harmoniously. District Basic Education officers (DBEOs) should calculate 1.0 km distance only if there is confusion between distance and wards. In every other case, wards may very well serve the purpose without abrogating the values espoused by the RTE Act. GO No 33577 – 926 notified on 6 January 2015 (Rule 1) instructs the DBEO to identify only urban wards in the district headquarter for enforcement of the 25% reservation clause. This is because the government feels that identifying unaided private schools is not important outside the urban areas. It is pertinent to flag at this juncture that 5,65,406 out of 6,37,149 seats identified in the DISE report, belong to rural areas. A vast segment of EWS and disadvantaged students are kept in abeyance in rural areas from availing the right conferred upon them under the RTE Act. The stinking rule not only commits a treachery on the 2009 Act, and the state Rules, but also wrecks all corners of the equality clause under the Indian Constitution. No delegated legislation can transgress the provisions of the enabling statute and Part III rights under the Constitution. It is an equally settled principle that a subordinate legislation cannot be permitted to curb the enabling statute. This rule unsettles the policy enunciated by the RTE Act and must be set aside. The state must consciously take a note of this and make a whole hearted endeavour in securing the admissions of EWS and DG in the coming admission season starting this year. Rule 1 and Rule 2 of the 2015 GO compels the EWS and disadvantaged students to take admissions in government/board/aided schools in their respective wards. A student may seek admission in private unaided schools only if such schools do not exist in their ward. Such perverse rules mangle the spirit of this provision read with Article 21A of the Constitution. This reading is consistent with the ruling of the Supreme Court in In Re Delhi Laws Act case (1951) as well as Dwarka Prasad v. State of U.P. (1954). To illustrate, say A, who is an EWS or disadvantaged student is keen on taking admission in a private unaided school M within her neighbourhood. Now, A will only be able to seek admission in M if there is no government/board/aided school in her neighbourhood or if all the seats in a government/board/aided schools are filled. Neither Section 3 nor the definition of ‘school’ contained in Section 2(n) lays down a preferential order in respect to the said schools for the purpose of admission therein. The area or limits of ‘neighborhood’ through not defined in the Act, 2009 has been specified in Rule 7 (3) read with Rule 4 (1) of the Rules 2011 framed by the State of U.P. to mean, in respect of children in Class I to V, a school ‘within a distance of 1.0 km and population of 300. Thus, as per a conjoint reading of the aforesaid provisions, a child residing within a 1.0 km of the Schools as defined in Section 2 (n), is entitled to free and compulsory education in any of the said schools, therefore, the contention of learned counsel appearing for the petitioners that, first of all the admission are to be made in a Government/Board/Aided school and only if the seats are not available therein, the 4th category of unaided school, such as the petitioner can be asked to make admissions, is not borne out from the provisions and scheme of the Act 2009. This is not the intention of the legislature. Having the option of more than one school in the neighborhood, the child or the guardian has the right to choose therefrom. This decision goes against “hierarchy” and allows EWS and disadvantaged students the “choice” to seek admission in any private unaided school within their neighborhood. The irony is that in PM Narendra Modi’s own constituency, Varanasi, only three wards out of roughly 50 (urban) wards have been identified where 25% reservation clause is applicable. This only adds insult to the injury and mocks the whole bureaucratic process. The DBEO awaits the verdict of the Supreme Court before which the judgment of the Lucknow Bench has been appealed and the constitutional promise of dignified life to EWS and disadvantaged students has been kept on hold. The RTE Act obligates providing education to children in the age group of 6–14 years. There have been many instances where EWS and DG group children in the age bracket of 6–7 years were denied admission without giving any reason. A recently obtained Right to Information Act report revealed that 10 out of 21 students in Varanasi were denied admission last year despite fulfilling the age criterion. The exercise of discretion by the executive in the present case is an assault on the norms of public reason. Public reason, in democratic institutions, is often invoked as a relevant standard to evaluate rules and govern the executive’s conduct. Public reason, whose subject is always public good, mandates the executive to exercise its discretion in a fair and reasonable way. Distinct from the idea of public reason, the ideal of public reason is satisfied when the executive acts from and follows the idea of public reason and attempts to explain to other citizens their reasons for supporting fundamental political positions in terms of the political conception of justice they regard as the most reasonable (Rawls 1997). However no definition of justice can explain why 6–14 year-old children should be kept out of schools, citing arbitrary age-related reasons. If one digs deep, one might sense an obnoxious collusion between the unaided private schools and the state government. The state must function in a fair and transparent manner and any aberration in the implementation of the 25% clause in the RTE Act must be strongly dealt with by the courts. The fundamental liberties, especially of children seeking primary education, must be safeguarded in all possible situations and the state must protect it at all costs. Lucknow: Parents and social activists are staging an indefinite protest in the state capital against the flouting of the Right to Education Act (2009) in Uttar Pradesh schools and the reluctance of the Akhilesh government to implement the same. For instance, Lucknow’s City Montessori School has stubbornly refused to admit children under the RTE Act. The school has persistently ignored the orders of the district magistrate to admit 31 such students in the new academic session. On the contrary, the school management has even challenged the order in the Lucknow bench of Allahabad high court. The high court has ordered the Basic Shiksha Adhikari of Lucknow to inspect if ample space was available in the school to accommodate the 31 students.